I have used components of the Daily 5 for a couple of years now, but I have never gone full on Daily 5. That's my big goal for this year, along with guided math groups. 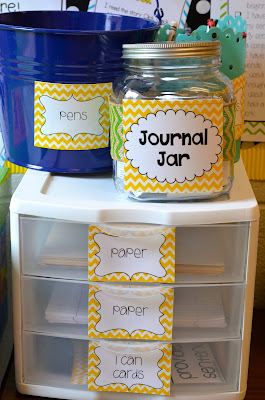 I knew I had to revamp my writer's workstation to meet the common core standards and get these littles ready for third grade. I decided to create a Common Core Writing Workstation. The pack has all of the printables you will need to start your very own, along with other ideas to incorporate into the station. I thought I would dedicate a post to explain the major components of it. I am keeping the tools very simple right now. Until they get comfortable with what is in the workstation, I won't add new components or tools. I included a list of tools to use in the station in the packet. I will teach them as a whole group for a while how the workstation will work until they are comfortable with it and can perform the task independently. I have started with only having two kinds of paper, highlighters, colored pencils, pencils, and crayons. As the new wears off, I will add fun paper, envelopes, and other fun writing utensils. Choice is so important in any work station. My students each have a writer's workshop folder. At the beginning of the year, we create a writer's heart in which they list everything that is important to them. I put this in the front of their folder for them to refer to for ideas to write about. I let them write about anything they want at the workstation. They are much more willing to write when you do this. 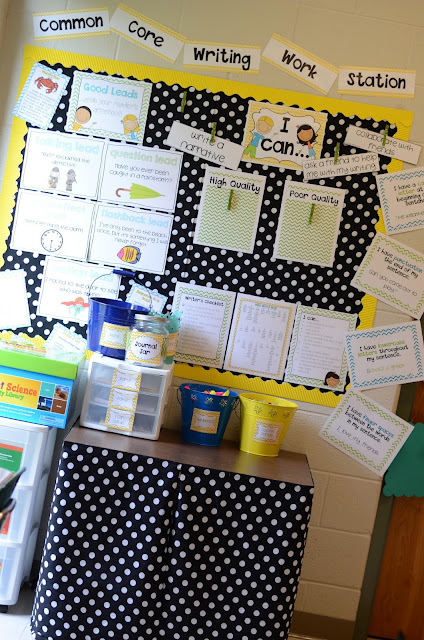 I posted a writer's checklist, a mini word wall, and an "I can" chart for students. You could also put this in their folder for reference during your writer's workshop time. You could laminate the checklist so it could be reused each time they create a new piece. 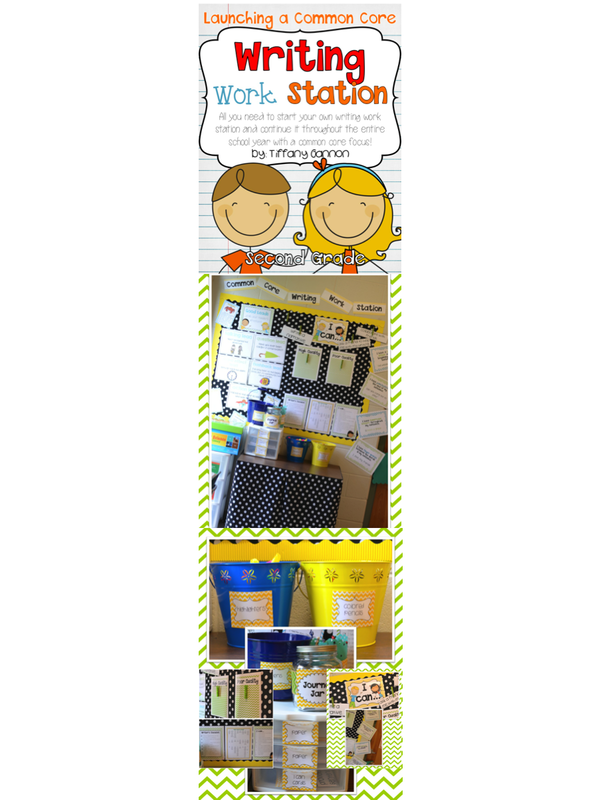 I have also included mini-posters for each of the I can choices for students to refer to as examples. You always have those students who say they can't think of anything to write! You know who they are! I made a little journal jar with tons of writing prompts to choose from, so no excuses! ;) I keep current paper in the drawers below, along with my common core standards cards. During my writer's block, I teach a mini-lesson at the beginning with lots of modeling and then I send students off to apply what they learned in their writing. This year, I am incorporating lots more common core so I created some I can cards for the workstation's board. I will switch these out based on what I have already taught. I won't put these in the station until I feel that students can practice these there independently. I will also spend some mini-lessons teaching good leads. These are so important for composing a good piece! 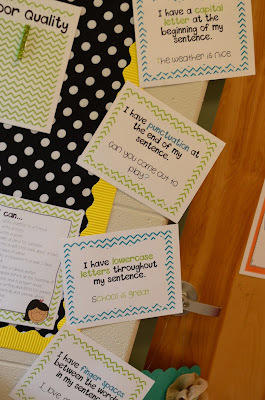 These will be great reminders for them when writing to include them. These are very valuable in a writer's workstation. Children are competitive and want to please. When you set high expectations, they will do whatever they can to meet them. I would not use anyone in your current class's work for this component. 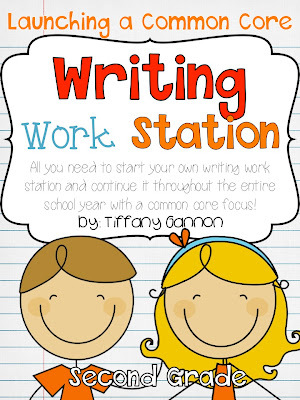 You can view this Common Core Writing Workstation for Second Grade in my TPT store. You can also check out my Common Core Writing Workstations for First Grade and Third Grade, as well! Our first full day is Tuesday! Have a great rest of the weekend! Beautiful! I'm really loving the yellow chevron. Wonderful ideas organized so beautifully. :) we don't use common core (I'm in Texas we use TEKs) but still a lot of the same ideas here. I love this and have it on my wishlist! You made a beautiful board. Great resources you have created! I was wondering what font you use to type your blog in and what the font was called that you used to write "lemony" at the top of your blog in the middle. Thanks! Author's Purpose and a Little Catch-Up!